Sure, Ben’s Chili Bowl gets most of the hype when it comes to half smokes, the porky, beefy, smoky sausage treats that call DC home. And to be sure, Ben's has soaked up enough late-night booze on U Street to have thoroughly earned its place in DC's heart and arteries. 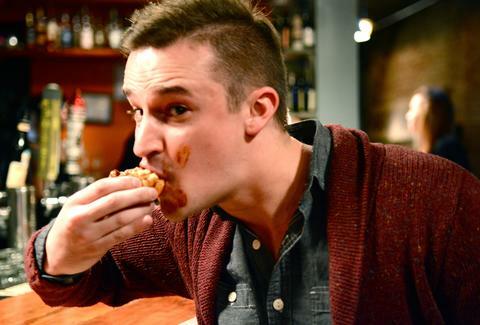 But it's good to broaden your horizons, especially if said broadening leads to the consumption of more encased meats. Here are seven other takes worth your attention... including one you can drink! This VA roadside gem has the buns to say they’re home to the original half smoke. 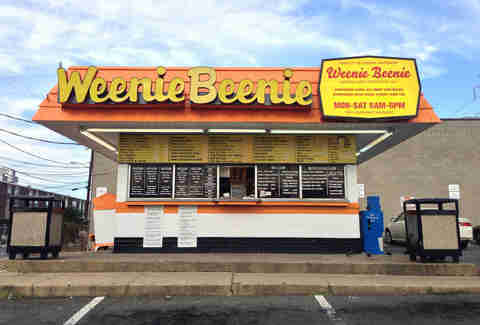 This is no hollow claim -- Weenie Beenie has a few years on Ben’s Chili Bowl. Not only is WB older and wiser, but cheaper too. 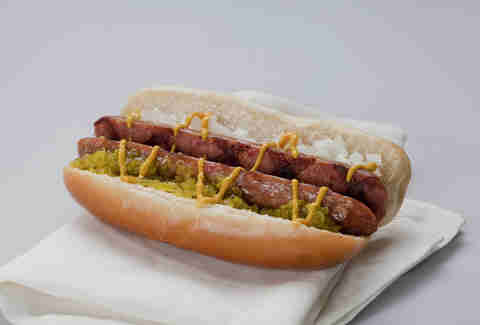 A fully loaded half smoke topped with a runny egg runs $1.46 less than a Ben’s original -- even eggified. That Foo Fighters’ jam “Weenie Beenie”, is no coincidence -- Dave Grohl used to call Alexandria home. Tear it off, but not a lot. The Passenger's best known as a cocktail haven, but don't skip the food menu. Their bun-busting half smoke comes fully loaded, not unlike certain talking cars. Lose yourself in the deep mahogany of their rich chili, then gawk at the onions. They’re diced so small it MUST have been the work of a ninja. Are there ninjas hiding in there? Just keep eating. It'll calm your nerves. No chili on top? What kind of fancypants does this half smoke think it is?! The delicious kind, OKAY? Everything from the Old Bay pork rinds on the side to the spicy pickles to the half smoke itself are made in house. The link itself has great texture -- it's not pulverized and you can actually see pork fat and beef commingling before they start commingling with your belly fat. I hate guacamole… said no one ever. That’s why Bold Bite’s DC Guac half smoke was born. 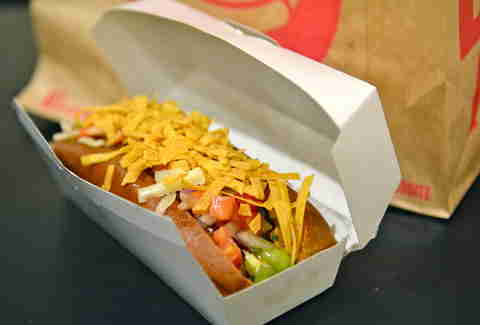 It also comes with pico de gallo, cilantro lime sauce, Monterey Jack cheese, and crispy tortilla strips. Prefer to go East instead of South of the border? Try the DC Asian with slaw, Hot & Bold sauce, and toasted sesame seeds. Note: both of these ethnic adventures cost less than a Ben’s original. 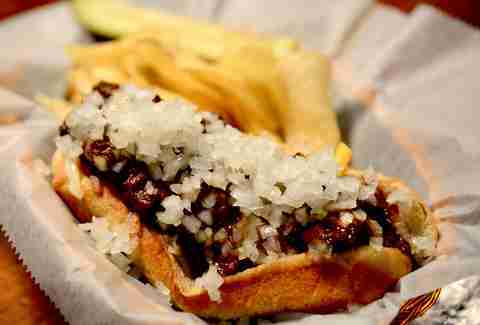 Another option for the chili averse, the DC Hot Half Smoke at DC-3 keeps it exceedingly simple with onions, relish, and yellow mustard. While it's clear that DC-3 was named for "The Plane That Changed the World", we prefer to think it means you can’t exit until you’ve downed three dogs and attained at least three mustard stains. Gone are the days of washing down a half smoke with a cold beer. Okay, those days probably aren't actually gone, but Boundary Stone has another fine suggestion. 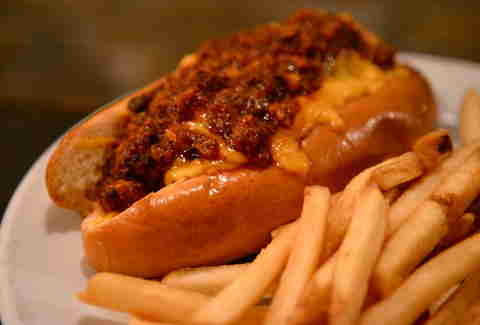 Try their chili cheese half smoke with one of 105 different whiskeys. If you want to stay on-theme, get the High West Campfire or Whistlepig "Bosshog" 12yr. 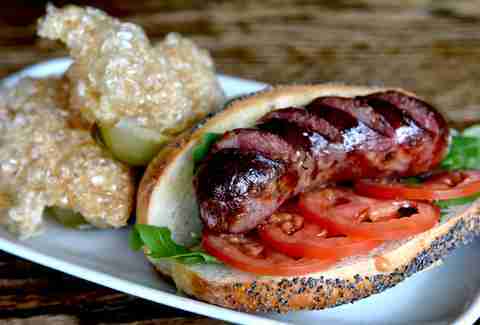 As for the sausage itself, it hails from 13th St Meats and is topped with house-made chili and aged Vermont cheddar cheese. On a liquid diet but still want a half smoke? 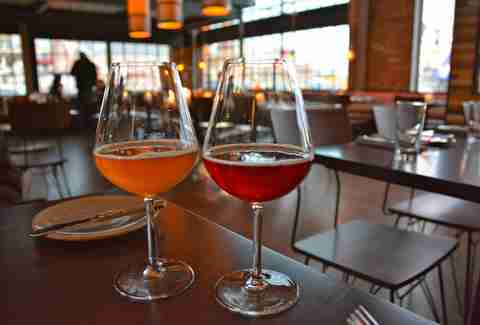 Bluejacket, that Navy Yard brewery that gets seriously creative with their brews, pours The Butcher on draft. The dunkles doppelbock is not only brewed with 10% Red Apron-smoked malt, but it's also seasoned with Red Apron half smoke spice mix. It's the most important pork-influenced beverage since hot ham water.